Mildred Loving of the Virginia vs. Loving case fame died last week Friday. In 1958, she married her white sweetheart Richard in Washington DC since interracial marriage was illegal in their home state of Virginia. Virginia’s tourism motto is “Virginia is for Lovers” and the Lovings helped make that a little truer for interracial couples. 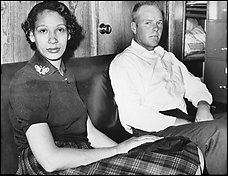 Mildred Jeter Loving, 68, a black woman whose refusal to accept Virginia’s ban on interracial marriage led to a U.S. Supreme Court decision in 1967 that struck down similar laws across the country, died of pneumonia Friday at her home in Milford, Va.
Interracial couples everywhere and their families as well as any morally decent individual owe a debt of gratitude to Richard and Mildred Loving for the hardship they endured to love, marry, and challenge unjust laws so that they and others like them might live their lives without fear. Thank you. This story was also made into an excellent movie called Mr. and Mrs. Loving. Next up for the Supreme Court, should be the legalization of gay marriage. I think we will have to wait for the current crop on the Supreme Court to retire and for the next generation to be in power before we see that happen. Previous Previous post: Did You Kill People Over There?